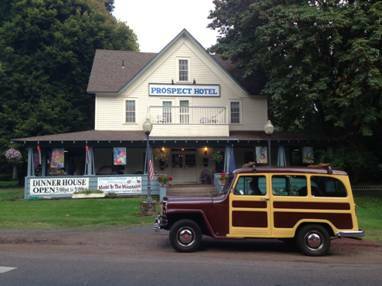 Jean and I spent the night of September 17th in lodgings affiliated with the historic Prospect Hotel in Prospect, Oregon about 50 miles from the southeast entrance to Crater Lake National Park. 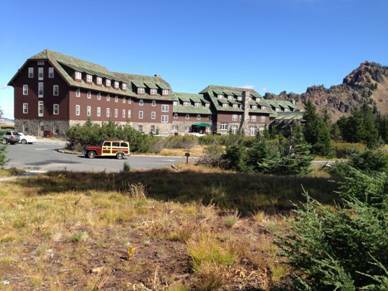 Constructed in the 1880’s, the hotel was in existence prior to the 1920 Park-to-Park tour. We drove through Crater Lake National Park using the west section of the rim road on our way from Corvallis, Oregon to our lodging in Prospect, Oregon. The Rim Road was heavily fogged in. We could see absolutely nothing of the Lake or the surrounding terrain (and little of the road). We made the best of it by stopping to view a film about the Park at the Visitors Center. There we were told that clear-to-partly skies were predicted for the next morning with a chance of isolated showers in the afternoon. We elected to stay in the Prospect Hotel’s motel-like annex rather than the main Bed & Breakfast hotel, as we were hoping to get on the road to Crater Lake early the next morning. We did not want to risk the opportunity to see the lake because of fog or rain (and yes, the room without breakfast was less expensive). Not wanting to miss an opportunity to see the Lake, we skipped breakfast and headed directly for the Park. With the morning cloudiness burning off as we headed for the Park, we decided to risk a stop at Natural Bridge on our way in. We were surprised to find that rather than the traditional elevated stone arch of natural bridges that we had seen on previous Jeep outings in Virginia and Georgia, this one was an extinct lava tube through which a respectable size stream flows. Except in heavy flow occasions when the tube cannot handle the full flow of water, a section of the otherwise aboveground stream is naturally channeled underground through the lava tube and exits back into the aboveground stream bed approximately 300 feet downstream. The stream was running at a fairly good rate probably due to the rains of the previous day. Seeing all that raging water disappear into the ground beneath our lookout vantage point and reappear just within our sight downstream was quite impressive. As we traveled further up the slope of Mount Mazama toward the crater confined within, the skies continued to deepen in blue and the few puffy clouds remained scattered; so we decided to make a 12 mile side trip off of our counterclockwise drive around the rim road to see Pinnacles, a collection of mineral projections formed by the fusion of volcanic ash by superhot fumaroles. It was worth the trip. Now finally we were back on the rim road anxiously looking forward to our first look of Crater Lake. But first we had to pay our dues. What they don’t tell you in the brochures (speculation, since I do not read the brochures) is that the majority of the rim road snakes its way (snake being the operative word) along the outside of the crater’s rim – that is, the side away from the lake. 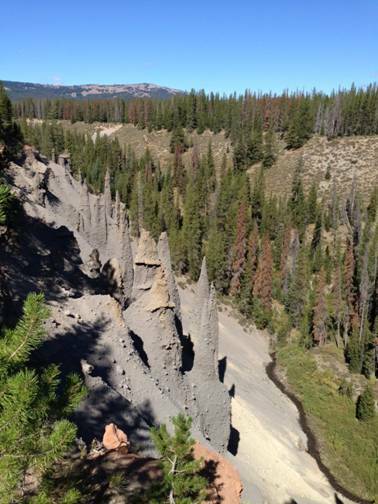 The crater walls are high and have steep slopes on both the inside (lake side) and the outside. So, if one travels the rim road in the counterclockwise direction as we did, and naturally being on the right side of the road, one finds one’s self perilously close to the steep (and deep) downhill of the crater’s outer slopes. Maneuvering the handling-challenged Jeep on this road with its abrupt elevation changes and sharp curves with the often un-guarded downward slopes (cliffs in some cases) on my right made this passage the most harrowing to me of any on the visits to five of the western National Parks thus far taken on this trek. All the time, Jean was clicking off photographs and videos; I surmised either to keep her mind off of the imminence of death or to document its occurrence for the Accident Investigation Team – our own “black box recorder”. Anyway, it was worth the near-death experience. The view of the lake from the various overlooks was truly spectacular. Surely, the mountains, waterfalls, geological formations, steaming and boiling features, and variety of animals that we had observed over the last month were awe inspiring; but the sight of that massive blue lake with its two islands was truly memorable. 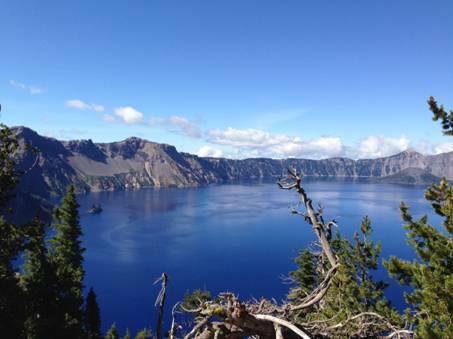 Perhaps it is the combination of viewing from elevations that permitted on to see practically the whole lake from each vantage point, the contrast in “textures” between the glasslike flatness of the lake surface and the tall craggy slopes of the crater’s rim, together with the color contrast between the pure blue of the lake and the mottled shades of brown of the crater’s slopes. Anyway, the views were so spectacular that even the photos that I took looked great un-retouched. 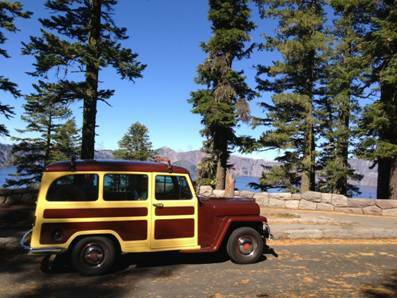 We capped off counterclockwise sojourn of Crater Lake National Park with a stop at Crater Lake Lodge to take a photo of the Jeep in a similar setting as one taken during the 1920 Park-to-Park tour. Due to the conspicuous appearance of our vehicle, we ran into (not over) many folks several times during our time in the Park. They recognized us, and I of course, had to be reminded. Anyway, it was fun visiting with folks from places such as Seattle and northern England. We left the park at around 4pm on the 18th and having anticipated that we would not be up for much travel that evening, set out for our evening lodging in Klamath Falls, Oregon only about two hours from Crater Lake National Park.